Let your children see you reading a variety of materials. 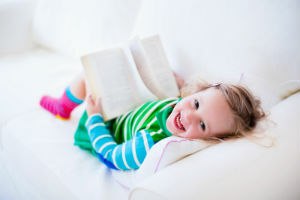 When your children see you reading, they learn that reading is pleasurable, they learn that they can get information from reading, and they learn that reading is a way to have interesting conversations. Start young and read with your children. Turn off any distractions. 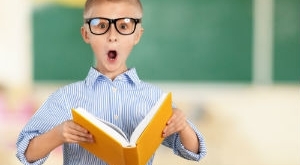 Reading for kids can be a lot of fun—use different voices and facial expressions. When your child is old enough to express things, ask open-ended questions: “Why do you think he did that?” “What do you think is going to happen next?” They will learn reading skills from the process. Let your children find words. Ask them to point out a word on label, or show them a word that indicates something they like. Children will quickly learn the names of things they like best, and they will be happy to share when they’ve found one. Not every child will enjoy hatted felines or colored food. 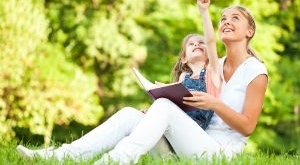 Find material that your children enjoy and read it with them. Children also get greater enjoyment from books that they select or if they have input in the selection. As your children’s skills develop, ask them to find things in the pantry or store. Encourage them to seek out more difficult material. Ask them to read instructions to you as you follow them. Look for opportunities to have them read difficult things. Reading is fundamental to all other learning. Additional support when needed is worth the effort. A reading tutor or a reading center like Read Smart can help your child catch up on any reading skills they may need. Engaging with them early will help you identify where they may need reading help. Reading opens the doors to the world! Contact us today.